The testing of recently released beta version hasn’t shown any problems, so today we’re glad to present an official release of dhtmlxSuite 4.4. 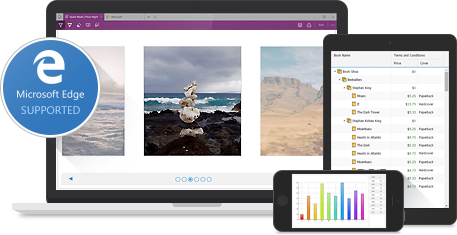 Since last update that was a month ago, we haven’t added any new features, but set another goal – prepare the library for a new browser, Microsoft Edge, that will be released in a week as a part of Windows 10. Anyway, we’ve fixed the known bugs and made some performance improvements. Full what’s new list can be found here. DHTMLX Skin Builder is an online tool for creating a custom skin for the interface of your DHTMLX based applications. We’ve added two new features that will help you to work with your already created skin. 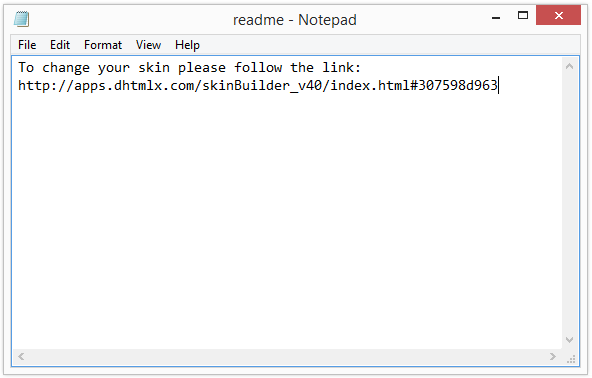 Now you may upload the CSS of the skin that was created in DHTMLX Skin Builder till this update. This feature is very useful for the users who would like to migrate from 3.6 to 4.x without the necessity to redraw their skins from the start in order to fit the updated look of the library in the version 4.0. 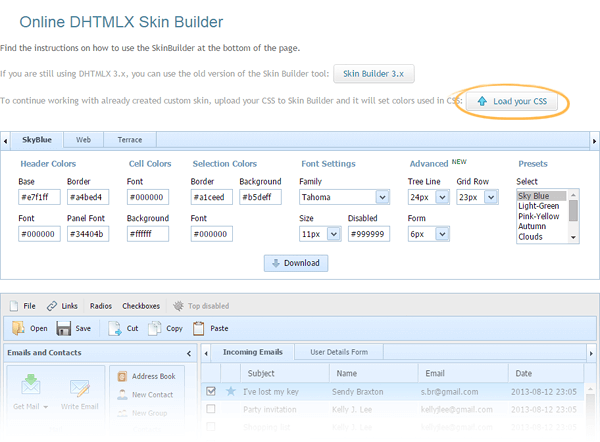 To upload your CSS use “Load your CSS” button on Skin Builder page (see the picture below). The aim of this feature is similar to the previous one. It allows you not to start setting your custom skin from the start but continue working with already created skin. So now, when you click the Download button, you get a zip file with necessary files – .css and images and readme.txt file that includes a link to your skin. If you follow this link, you’ll go to Skin Builder page with your already created color scheme so you may keep on changing color/font settings. You are welcome to download dhtmlxSuite 4.4 Standard Edition here. PRO users with active support subscription will receive the update via email.